If you're like me, you probably copy, move and delete files using Windows Explorer and end up with several Explorer windows open at the same time. If you have the Windows taskbar docked on the side of your screen, the ungrouped icons all look the same. Windows provides a very easy and effective solution with custom folder icons. Select a folder you use regularly and open the folder properties then go to the Customize tab. 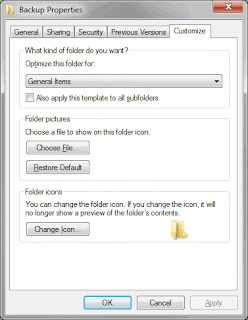 Then click "Change Icon" and select the icon that best fits that folder. Several icons are provide with windows, however there are plenty of free icon libraries available on the web. That's it! Now whenever an Explorer window is open to that folder the taskbar icon will change to indicate the current location. If you have any feedback or helpful tips, please leave a comment below or contact me directly.